Spurn Point has had a varied history and over the last 20 years the road along the point been swept away about 6 times and then rebuilt with concrete slabs. In recent years there have have been two incidents, one happened on the 28th August 2011 damaging small sections of the road and closing it for over 2 weeks while the road was repaired, and again on the 5th December 2013 a North Sea tidal surge swept over the peninsula breaching an area of 800 metres which has had a devastating effect. The Nature reserve is now closed to vehicles and can only accessed on foot or bicycle, but there is a 4x4 vehicle to cross the breach at low tide on a 2 hour Safari. Spurn Point is a natural breakwater between the Humber and the North Sea and has been a land mark for shipping for 100's of years. There is the Spurn Low Light that has been used as an explosive store and a water tower since it was replaced in 1895 by the present lighthouse which was in service for 90 years when it was last used in 1985. The peninsula of sand and shingle, was an important Military base until the 1950's when they left and then in 1960 it was acquired by the Yorkshire Wildlife Trust. 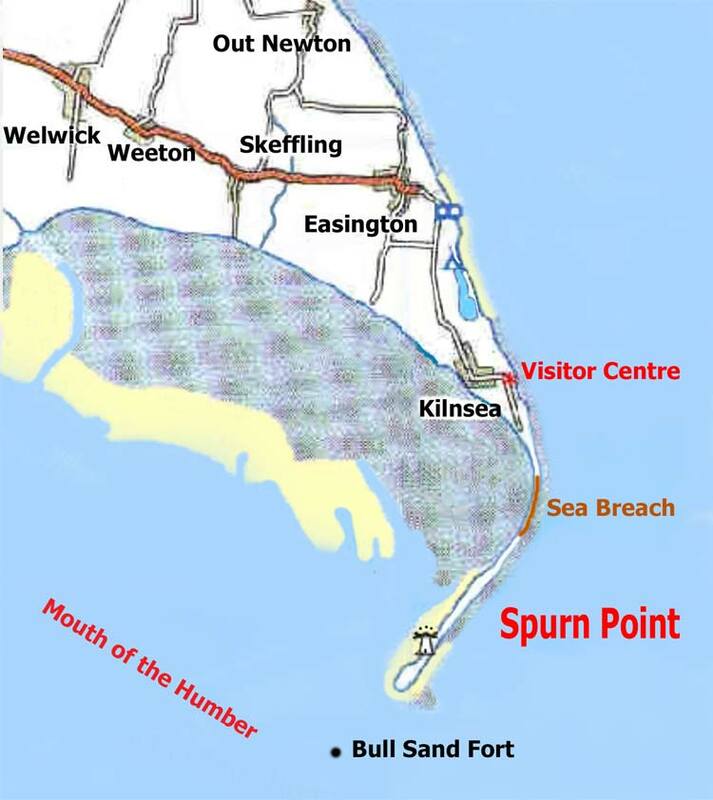 A map diagram of Spurn point showing the sea breach and the local villages and the Visitor Centre. This is an aerial view of the peninsula taken around 2007, with the North Sea on the right and the River Humber on the left. 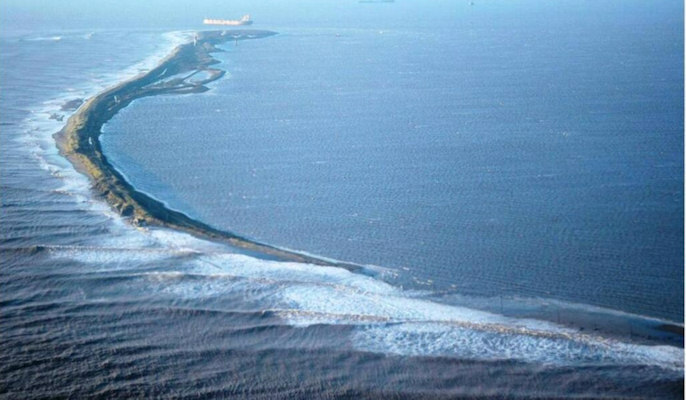 This is a 6 km long spindly peninsula of sand and shingle, that hooks into the Humber estuary. 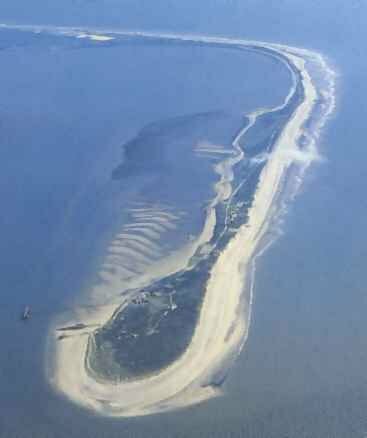 It has built up over a period of years with deposits from the eroding shores to the north and the build up of silt from the River Humber. This region from the village to the north, Kilnsea (which has two shores the seaward one is a sandy beach while the other one in the Humber estuary is muddy sand but sheltered) to Spurn Point is now a National Nature Reserve. 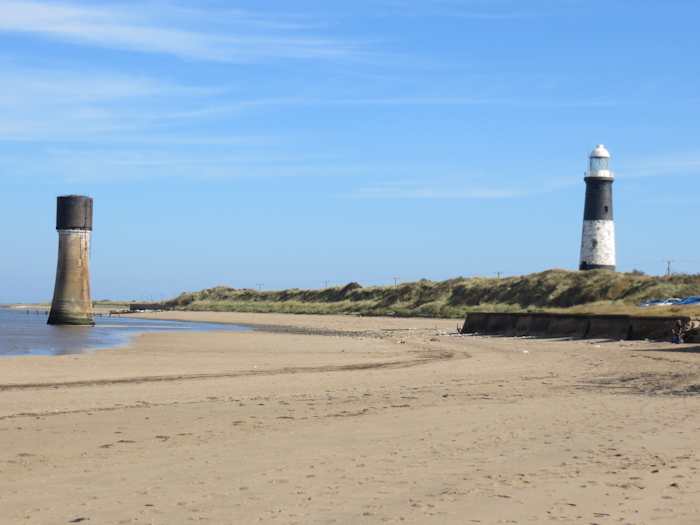 There is no vehicular access on to the Point and admission to the nature reserve is free but there are entry fees for the lighthouse and for Spurn Safaris. From the Blue Bell Visitor Centre it is about 3½ walk along the shore to the tip of the head it will rquire you to ensure you plan to include the high tides to ensure you are not stranded when the point is cut off from the mainland. At the head moored just off the jetty is the Humber lifeboat, one of only three in the country, manned by a full time crew. At the jetty you will see the comings and goings of the Humber Pilots as they go and guide the shipping in and out of the Humber through the difficult and narrow shipping lanes. This document maintained by webmaster@riverhumber.com Material Copyright © 2000-2016 ktaylor297. All Rights Reserved.